With this evolution of its design process, Evans has launched a true revolution in drum heads. Superbly playable. Well designed and built. Easy tuning. 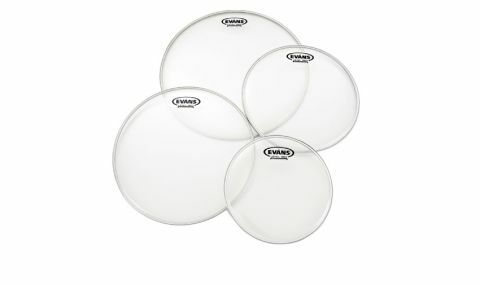 With the Level 360, Evans has not invented a new range of drum heads, but rather it has introduced a new philosophy to each of its head ranges. The Level 360 concept brings a modified design to Evans' head offerings. These tweaks aim to ensure greater contact and balance between the head and drum, as well as greater tonal range. We were sent a batch of Evans clear G1 Level 360 heads. It is how the 360 concept aids tuning and sound that will be the focus of this review, rather than the sound of the G1 clears themselves. Unpacking the heads we notice immediate differences between them and our set of pre-Level 360 G1s, including the noticeably steeper collar and new roll-over hoop design. We were sent 10", 12", 14" and 16" sizes, Evans is able to supply the 360 design in any of its heads from 6" to 16". "Tuning is a breeze, far easier than on any other set of heads we have used"
On placing the heads onto the shells of our kit we notice that each head fits perfectly. Just to make sure that this is consistent on a range of shells, we then do the same on several other kits and again we have no issues, with each head snugly fitting to the shell. Back to the main review kit and we are able to get our preferred warm tone with minimal effort. A couple of minutes tuning using the cross method by ear and we arrive at a sound that we're happy with - suddenly tuning is a breeze, far easier than on any other set of heads we have used, Evans or otherwise. Along the way to reaching our chosen sound we also notice fewer wrinkles in the head when compared to the regular G1 clear series. Evans promises greater tonal capabilities, and we must admit we were able to bounce from a rich timbre to a wet, fat attack with just a few turns of the drum key. Even better, after several weeks of play the heads remain beautifully tuned despite minimal tweaking. On going back to our trusty pre-360 G1s we also notice that these now seem to lack a degree of high-end ping that is achieved so easily with these new Level 360 heads.